Parents and students are invited to celebrate the new athletic fields with the first official home games of the fall sports season! The action on our fields begins with a Close-wide “double header” on Friday, September 11. Go, Bulldogs and Eagles! On Saturday, September 12, St. Albans hosts the annual DCSAA Pigskin Kickoff Classic, celebrating the opening of football season in D.C. The DCSAA will livestream the football games on their website www.dcsaasports.org. Between games on both days, Acting Headmaster David Baad ’83 will welcome everyone back home to our fields and the Rev. Heather Patton Graham, Lower School chaplain, will bless our fields. Be sure to wear your best St. Albans blue and white, and let’s go, Bulldogs! Also, mark your calendars for our first home cross-country meet on Saturday, October 3, during Homecoming Weekend. The whole St. Albans community will be out to celebrate our fall athletes! Please visit www.stalbansschool.org/homecoming for the full game schedule. Parking: All visitors should park on the Cathedral grounds or in the Cathedral garage (address 3101 Wisconsin Ave NW) and not on neighborhood streets. During the football games on Saturday, September 12, parking in the garage will be free. Pull a ticket to enter and the gate will be up as you exit. Thank you for helping us be a good neighbor! 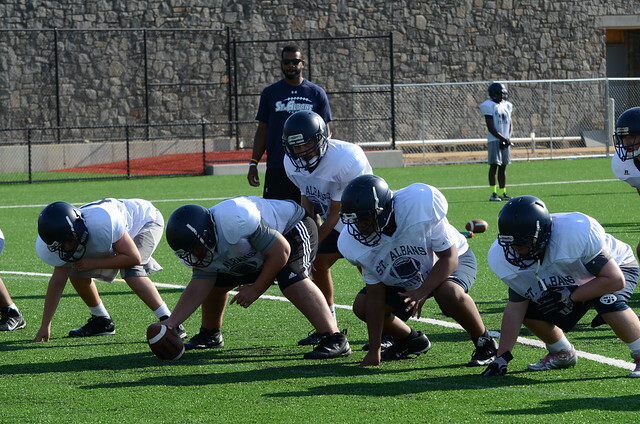 Enjoy photos of the varsity football and soccer teams practicing on the new fields!